The Institute of Semitic Studies is proud to be the first, and only, independent Institute dedicated to the study of ancient Semitic languages and cultures in the USA. These cultures are fundamental to current world religions, especially Christianity, Islam, and Judaism, and their contributions to civilization and their role in generating or solving conflicts. The Institute is a major scholarly and public forum for Semitic and Afroasiatic Studies recognized nationally and internationally. Its work has caught wide national and international attention, primarily due to its ability to use its limited resources effectively and efficiently. In a little less than a decade, its work was reported in five front-page newspaper stories (New York Times, 3; Trenton Times, 2), and its role discussed in one major editorial (Washington Post). Stories about the work of the Institute have been featured in the Boston Globe, Chicago Tribune, Christian Science Monitor, and several local, national, and international papers and other media including the BBC. Among the Institute’s great achievements to date is the sponsorship of the history-making 1989 symposium on the Dead Sea Scrolls, which brought together in Princeton for the first time the then Editor-in-Chief and other scholars responsible for publishing them. No history of the dispute over the access to the Dead Sea Scrolls can be written hence without reference to the historic symposium. It was editorialized in the Washington Post as a commendable peace-making effort among bitterly quarrelling scholars. The Institute supports a Princeton Theological Seminary project to make the Dead Sea Scrolls publicly available in their original Hebrew and/or Aramaic, with new English translations. It supports the University of Pennsylvania Sumerian dictionary Project. In 1988, it co-sponsored with the Univ. of Pennsylvania the 35th International Congress of Assyriology. In 1991, it co-sponsored with Princeton University the Fifth Congress of Judaeo-Arabic Studies and another on Ancient Iraq. It has organized other major scholarly projects and frequent public and educational programs. Among these are those on the Nabataeans, religions of pre-Islamic Arabia, and Ethiopic Christian manuscripts. 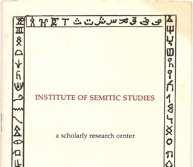 The Institute of Semitic Studies publishes the only major international scholarly Journal of Afroasiatic Languages (of which Semitic is the major branch) linguistics, printed by the Princeton University Press and distributed by EJ Brill of Holland. The Journal, the only one of its kind in the United States, offers substantial articles and a flock of reviews by distinguished scholars on Hebrew, Arabic, Ethiopic, and related ancient languages of Africa such as Berber, Oromo, and Coptic. The Institute has sponsored a major international symposium on Anti-Semitism and Racism to examine the historical roots of racial hatred as it affects people globally and to study attempts by wise people of all ages and cultures to promote tolerance. It was invited by the International Health Awareness Network, an affiliate of International Women’s Organization, to sponsor a symposium at the UN on Health Care and the Family in the Ancient Near East. Support for the work of the Institute has come from the Carnegie Corporation of New York, the National Endowment for the Humanities (NEH), the New Jersey Committee for the Humanities, the New York Committee for the Humanities, Bristol Myers Co, Blum Foundation, Lawrence Gelb Foundation, New York City Central Labor Council: AFL-CIO, State of Ben L. Burman, H. J. Stich Foundation, JDC, and many generous individuals all over the US. Although it is an independent advanced research center, the Institute has collaborated with Princeton University, Princeton Theological Seminary, the University of Pennsylvania, the New York Bar Association, the Israeli Association for Society and Culture, as well as Pennsylvania Governor’s Cultural Affairs Department, the University of the Arts, Please Touch Museum, the Woodrow Wilson Institute, and many others. The Institute has library privilege arrangements for visiting scholars at Princeton University. It has had the use of lecture halls at the University and Princeton Theological Seminary. But its goal is to find its own home and to build a manuscript microfilm library in order to strengthen the Institute’s role as a center for scholars, like the Institute for Advanced Study. The Institute’s work emphasizes and highlights the contribution of Semitic and Afroasiatic cultures to world culture, in general, and Western civilization, in particular. It focuses on the positive heritage shared by all Afroasiatic and Semitic-speaking peoples: Jews, Arabs, and Ethiopians. This effort can contribute not only to understanding both among these peoples and the international community, particularly at a time when peace and stability in the Red Sea and Horn of Africa regions are of paramount importance, but also to strengthening the foundation of international higher learning. The ISS possesses great likelihood of permanence, once endowed. It has already proved highly attractive to media coverage. Its domain of research and knowledge is right in the eye of present-day concerns. Therefore, the ISS can achieve for the Namer an impact that is unavailable to many philanthropies. This impact can be bought for money, but money itself could never open this opportunity. Now a window of opportunity exists for the Namer to have his/her name and reputation conjoined with the ISS in perpetuity. There is no other opportunity that can come for any donor or is likely to come that equals this one, in the magnification of philanthropy in the world. It is a matter of record that the ISS had spectacular successes in its mission in its all its years of existence: television coverage, major articles in The New York Times, funding from such organizations as The National Endowment for the Humanities and the New Jersey Council for the Humanities, SYMPOSIA that drew attendees from among the world’s leading scholars and their students, and a JOURNAL that drew immediate laud for excellence in filling a yawning niche. With secure endowment, the ISS could easily go on to even better and greater accomplishments. Its past record should be more than sufficient to guarantee this. Since its inception, the ISS had only success in its mission and projects. It is non-controversial in itself, even if some of its projects are designed to provoke controversy of a beneficial kind. There is no individual or organization that would oppose its endowment. Only good will come to the Namer. Sole sponsorship amounts to creation, and creation is noteworthy and becomes history. Finally, its past and future Director, Dr. Ephraim Isaac, is known all over the world and has been given accolades all over the world. He is a scholar of international repute—already a historical personality—whose propriety to serve as ISS director absolutely no one would ever question. In its important mission, the Institute now seeks visionary people as partners. It would be a distinct opportunity for anyone interested to work closely with the Institute to promote the appreciation of the contribution of Semitic peoples to Western civilization and to help it grow and flourish and play a major role in its future. The Director will gladly welcome the opportunity of discussing these ideas in detail and the great significance of a naming opportunity, past achievements, and present hopes of the Institute with any interested parties at their convenience.